Remember when the only “viral” things we had to deal with were diseases? Well, in the age of social media, any event or experience has the potential to spread across the internet like, well, a virus. Sometimes that’s good, because it means we see more cats getting into hilarious scrapes or memes featuring those American Chopper guys, but it can also mean that any client interaction that goes disastrously wrong can become extremely public extremely quickly. Think of how many times you’ve seen social media stories relating to incidents at airlines, restaurants, or hotels. You can probably even think of a few juicy incidents involving small businesses! While those accounts and the ensuing “epic” reviews can be good for a giggle, it’s important to remember that the same thing could very easily happen to anyone with a salon in Lawton, or to anyone who owns a small business of any type. And it’s also important to remember that there are often two sides to every story, and real people suffer when things go public. If you’ve ever had a referral or seen a review that affected your shopping and buying decisions, you’ll understand. We’ve talked a lot about social media and direct advertising to get the word out about your beauty industry business, but the truth is, word of mouth is still the most effective form of advertising, good or bad. And that’s why this month we’re talking about client experiences and getting those crucial referrals! Do you think of referrals as being “word-of-mouth” advertising? Well, they are! People trust referrals from their friends and family. We all know that beauty industry services such as haircuts, hair coloring, manicures, or massages can all be great or not so great. People trust referrals because they wish to have a good experience and minimize risk. The same impulse leads us to check online ratings on products we buy from Amazon or to read Yelp reviews of restaurants. People trust personal reviews, and they trust individual experience. Statistics bear this out. People are four times more likely to choose a service such as your salon in Lawton when referred there by a friend. And those referrals, if you impress them, are valuable. The lifetime value for a client referred to your salon is close to 20% higher than the lifetime value of a client who wasn’t referred by a friend. And if that’s not enough to convince you, 83% of clients are willing to refer others after they’ve had a positive experience. Simply by providing the best service possible and encouraging referrals (we’ll get to that later) you can really make your business grow! Steve Jobs, the co-founder of a little brand called Apple, once said, “We have to start with the customer experience we want to provide and then work our way back.” While he was talking about technology and not the salon and beauty industry, the idea is a sound one for all businesses and has proven to be true. After all, you probably have or have owned an Apple product or two, right? 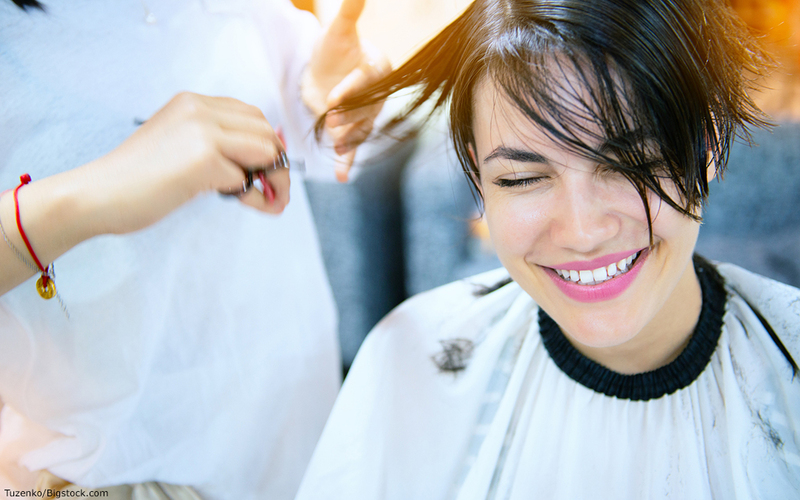 While the adage “the customer is always right” came about long before the visible nature of internet review culture, customer service is a priority for all businesses, your salon in Lawton included. Client experience is where the real battles are fought, for better or for worse. Because of the ease of checking personal reviews on sites such as Yelp, providing good service isn’t enough. Everyone’s trying to provide good service! You need to figure out the distinct and unique experience you want your clients to have at your salon. You want your salon to be the place clients come when they want professional beauty services, but what else do you want to focus on? Perhaps it’s sales of additional products and services, a listening ear, or gentle hands? Think of it this way: How do you want your clients to rave to their friends about you? “Oh, so-and-so is the best. Her cuts are solid, and her recommendations for hair care products are always on point.” “She’s so good not just at doing nail art, but at really listening and giving advice.” Work backwards from the experience you want them to have, and make it happen! The referrals will come in, trust us. And they’ll be the sorts of referrals you want. It’s the internet age. We all know how frustrating it can be when a consumer experience has way too many hoops to jump through. Make it easy on your clients. Think about it this way: How busy are you as a small business owner? We bet you use a ton of apps to keep organized and keep things simple. Think about the touch screen device in your fridge that allows you to order through Amazon Prime. That is probably one of the best examples of how a service provider and retailer has simplified a process for customers. Need more laundry detergent? Punch the button. It shows up from Amazon on your doorstep in two days. When you’re considering ways to define and improve your clients’ salon experience, reflect on how to make it easy for them to come to you. Since we’re talking about old sayings, here’s another one: “Never make it difficult for customers to give you their money.” What are the things you can do to simplify your clients’ lives, as well as give them superior service? Things don’t always go right, whether you’re a veteran health and beauty pro or if you’re new to salon life. It doesn’t matter if you’re renting a chair at a salon in the mall or leasing a mini salon suite. Every day will teach you something about customer service. Keep in mind that failures are not necessarily losses. Your most unhappy customers can provide a fantastic learning opportunity. When you receive complaints about your services or your salon in Lawton, turn them into action items and seek to redress them when defining your client experience! Salons de Beauté is a great place for your salon in Lawton to thrive. Contact us today and talk to us about our leasing opportunities and reasonable rates!